Is your baby a Good Baby baby????? I want to tell you all about some new "equipment" that Princess Junior now has in her arsenal. I can't even remember for sure how I stumbled across it but there were several things that struck me and I decided that I wanted to try it. When I arrived I was very impressed. Princess Junior will most likely be in diapers for a long time. Diapers = the inevitable rashes. We don't have to deal with that often but when we do, we need something reliable. And what mother wouldn't want something that is not packed with things that aren't necessarily good for their child's skin? 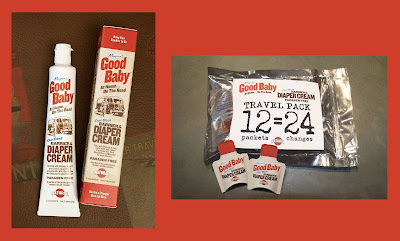 Introducing the Mayron's Good Baby product line! When I found this online what struck me first was that it was co-developed and created by someone I had actually heard of, Melanie Mayron, the actress I loved to watch in the TV series "thirtysomething", and not by not some big corporation that also makes furniture polish and drain cleaner. Then I read some more and saw that she and her dad really did have the credentials to do this. It wasn't just some Hollywood "star" slapping her name on some product in exchange for an occasional check. Melanie cared about what she used on her children. She didn't want the chemical laden products that flood the market. She is in the trenches with this one because she believes in the products! And part of the proceeds from the Good Baby line go to support Womens' Health Research in honor of her mother, a breast cancer survivor. How cool is that!?! Melanie and her father, David, have spent years developing a great product. David was an Assistant Director of Pharmaceuticals and Manager of International Pharmaceutical Services at SmithKline & French Laboratories. In 1988, he founded Mayron Research Laboratories, Inc., a contract laboratory specializing in formulation of liquid and semi-solid pharmaceuticals, cosmetic and personal care products, and re-formulation of products that need improvement in stability, texture or taste. He even holds a patent on the time-release tablet, among others. I know my son, who suffers from migraines, would thank him for that one! So... what's so special about Good Baby? Simple. No Paraben. No sodium lauryl sulfate. No DEA. Just clean, natural ingredients including essential oils, vitamins, and anti-oxidants in the aromatherapuetic tradition. When I first opened the tube, what impressed me was that it didn't smell funny. It was a nice clean, fresh smell! That was refreshing! And when I put some on the back of my hand, it went on smooth and wasn't at all sticky. Exactly the kind of thing I want for Princess Junior!!! The barrier cream is currently available in tubes and in handy travel packets! As you can see by the photo at the top of this posting, there is a complete line planned. And I have it on good authority (thanks, Melanie!) that there will be a new product launch in the next month or two. I know I'm looking forward to it! So be sure and check it out! You don't have to be a baby or have a baby to use Good Baby. There are loads of reasons that it can be used by people of any age. I know when I was a teen I would get chaffing because I didn't listen and change out of a wet swim suit. I wish this stuff had been around then! And, to quote a certain celebrity mom... ...you don’t have to be a baby to use it. After all, we’re all somebody's baby.